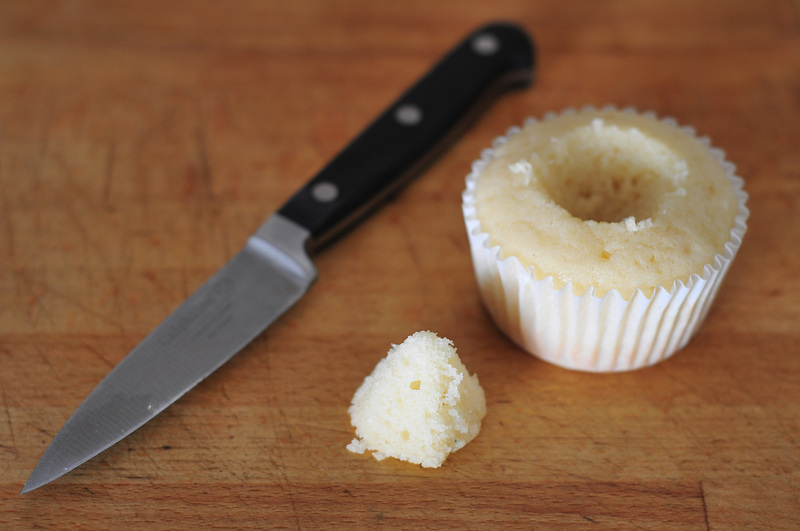 If you read my How To Make Stuffed Cupcakes post, these pictures probably look familiar to you. 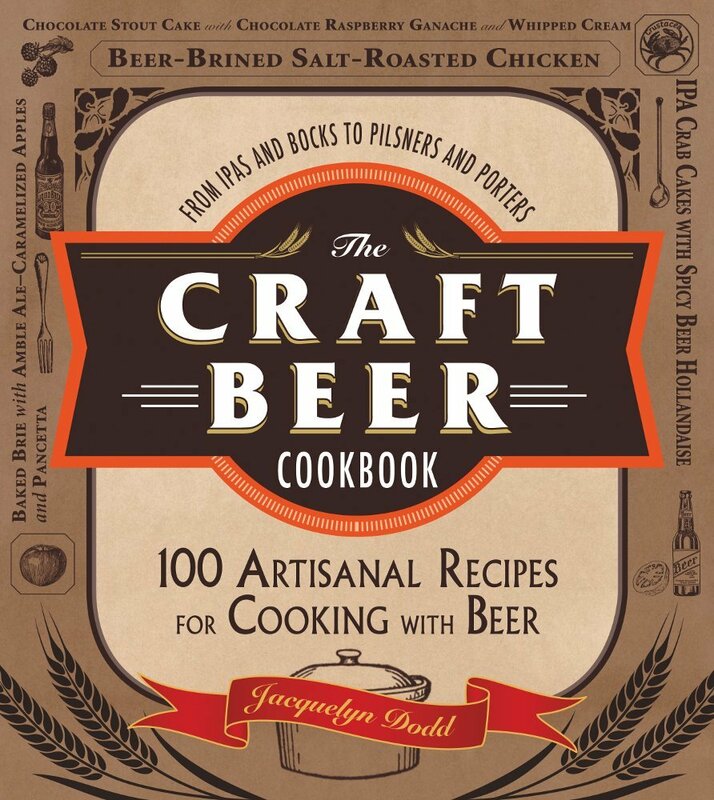 I had so many people ask for that recipe (OK, one. One person asked, but still…) that I decided to post my recipe for Boston Cream Pie cupcakes. In the bowl of a stand mixer, add the butter (softened!) and sugar and cream until light and fluffy. In a separate bowl combine the flour, baking powder and salt. Whisk until well combined. In another bowl, add the milk and oil. A bit at a time, add the egg whites to the butter and beat on high until well combined and fluffy. With mixer on medium, add the flour mixture and the milk mixture, alternating between the two until everything is just combined (don’t over beat). Add the batter to the cupcake papers until about 2/3 filled. Bake for 25-30 minutes or until the cake springs back when touched. While those are baking, make the pastry cream. You’re gonna love this stuff. I hope that this is what you will make from now on to fill your cakes with, instead of frosting. SO delicious, and pretty easy to make. Return the pastry cream to the stove and stir over medium/high heat until it comes to a rapid simmer. Continue to whisk until thickened, between 5 and 10 minutes. The cream should leave a track when you drag the whisk through it. Remove from heat and stir in the vanilla. This needs to cool before putting into a piping bag. Pour into a bowl and cover with plastic wrap, pressing it to the surface of the cream. This will avoid that gross skin that used to grow on top of the homemade pudding your grandma used to make when it sat in the fridge too long. You may, or may not remember my How To Make Stuffed Cupcakes post, but you use the same method of filling as I used for those. Take a small paring knife and remove a chunk of the center of the cupcake. Make sure you leave an ample amount of the wall and sides of the cupcake intact or the filling will run all over the place. Once the cream has cooled, spoon into a piping bag. Pipe the pastry cream into the middle of the cupcakes. Next, make the ganache. Ganache is really easy to make, and a fantastic alternative to frosting. This can also be used as a fabulous cake filling. 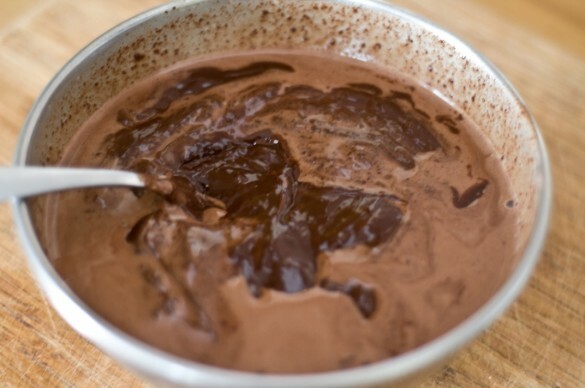 Put the chocolate in a heat safe bowl, sprinkle with espresso powder. You can omit the espresso powder, but the coffee flavor doesn’t come through with such a small amount. Coffee brightens the flavor of chocolate, that’s why so many chocolate cake recipes call for it. Heat the cream (microwave or stove, either is fine) until hot and steamy but NOT boiling. Pour the cream over the chocolate and stir. 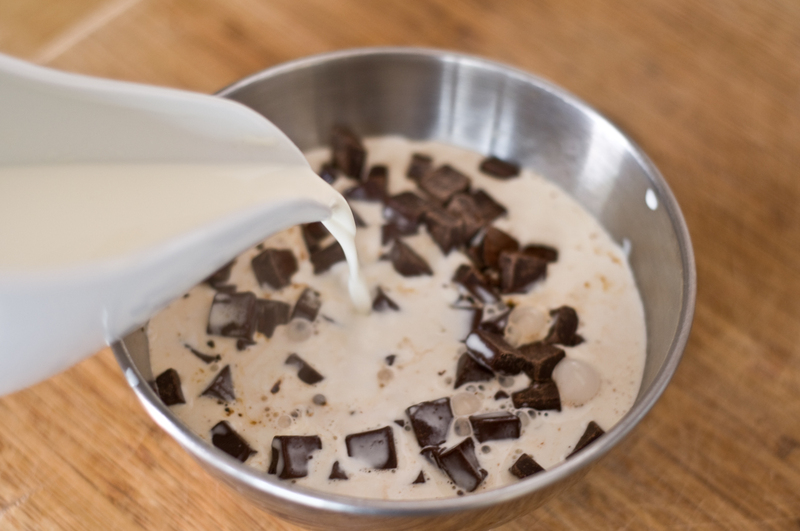 For a while, you are gonna stir and stir, and it will just look like chunky chocolate milk. Don’t worry, it’ll all work out. Just keep stirring until it’s smooth and creamy. 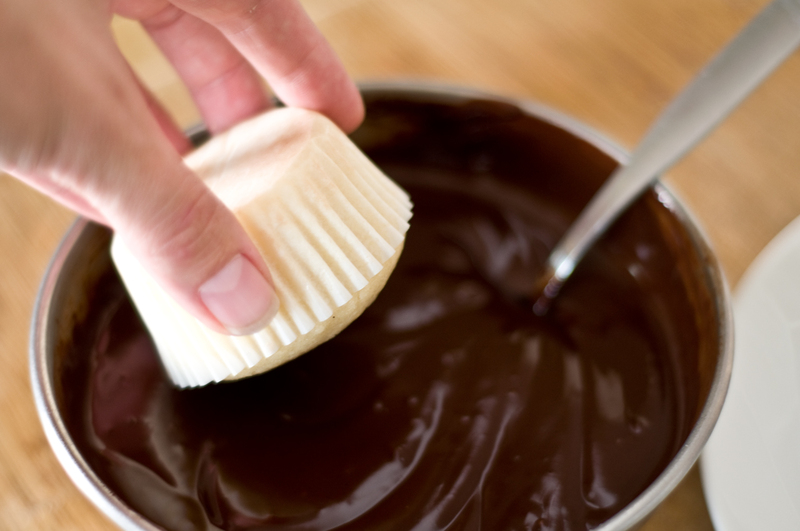 Dip your cupcakes in the warm ganache, swirl a bit. You can also spread it on with a spoon or pipe it on with a piping bag. I remember that post and I am glad you brought out the recipe for these. 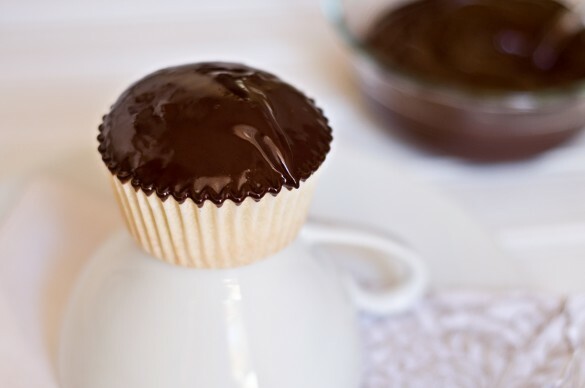 I love Boston cream pie and a cupcake form is perfect! I have saved this recipe-and loved your analogy of grandma’s pudding-ha. Great post. Can I eat these please? Now??? 🙂 I’m too exhausted to bake at the moment, but I really wish I could reach into the computer and grab one 🙂 thx! Your ganache icing is so, so neat! And the cross-section of your cupcake looks incredible… mmmmm. These look SO good. I could eat one this second- I love boston cream pie! Oh how I love Boston Creme Pie, but always end up with such a mess when I cut it into slices. Thanks, you just solved that problem. I can’t wait to make these! I didn’t have Boston Cream Pie for the first time until a few years ago. Now I’m a little infatuated with it. 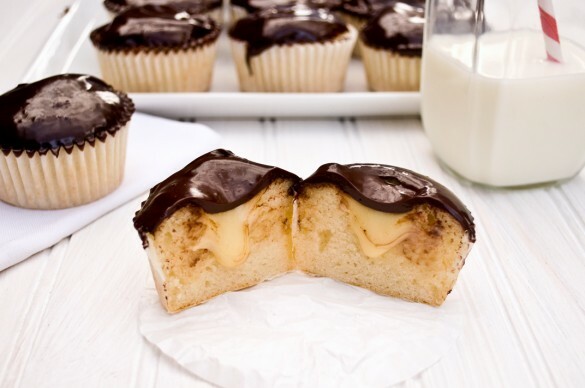 Oh my goodness – I have not had Boston cream pie in ions and have never tried making it. However, this just looked too good to pass on. I made these little devils over this past weekend and they were quite easy too. ALL of them were gone in less than an hour flat!! I’m not kidding – I had two and I don’t know where the others went. Is there a substitute for the espresso powder, or can I leave it out? You can leave it out, but the espresso powder makes the flavor of the chocolate more intense. That is why chocolate cake recipes call for coffee so often. It doesn’t taste like coffee, it just has a more intense chocolate flavor. Is there cream in the cupcake mix (its not listed)? But you said to combine the sugar and butter and cream to start making the batter….. Curious if Ive missed an ingredient. Thanks! I sure wish you would list the quantity of cupcakes that your recipes will make…just so I won’t be surprised later. Thanks. Hey Rick, sorry about that! This was a recipe from a while back when I first started blogging. I didn’t track the quantity as closely back then as I do now, but I believe this makes about 24.